Sometimes I tried to persuade my mother with sweet words to follow my instructions; however, she just wasn't able to follow them. Since I had no sibling to share the load, sometimes I felt so helpless and depressed. Sometimes, I couldn't help taking my frustration out on her, and I felt very remorseful afterwards. I knew she didn't intend to get ill, so I should be more patient with her. Whenever I felt stressed or down, I would calm myself down through practicing Tai Ji Men Qigong. Through proper respiration, I could ease myself and brought my heart to a peaceful tempo very quickly. Then, I resumed my job to take care of my mother again. Apart from this, I went to the Tai Ji Men Qigong Academy every week, where I shared what was on my mind and obtained good energy as other members shared their experiences with me and encouraged me. All of these helped me better cope with the challenges in my life. Our Shifu (master) often reminded us that nowadays many people are under stress and that their body, mind and soul are not well balanced. I understand that my mother's illness has to do with her insecurity and fear. Although my mother's condition hasn't improved, I am very fortunate to be a member of the Tai Ji Men family, for practicing qigong has enabled me to replenish my energy at any time so that I am able to stabilize my heart and slow down my pace of life. Therefore, I am able to let go of unimportant things and adjust myself to accommodate my mother's needs. Because my mother and I share a special bond, she can sense my love for her. Maybe she cannot remember the things in the past, but the most important thing is that she is as happy as a kid, and she is growing more energetic. Currently my daughter has entered the workplace. She is also a Tai Ji Men member. Our Shifu taught us to respect and take good care of our parents. My daughter knows that it's hard to take care of my mother, so she would voluntarily take care of my mother when she is free. I'm very fortunate that I have such a good daughter, and all my relatives have expressed their admiration and envy to me. I attribute all these to our Shifu's teaching. My daughter is the only child in the family, too. 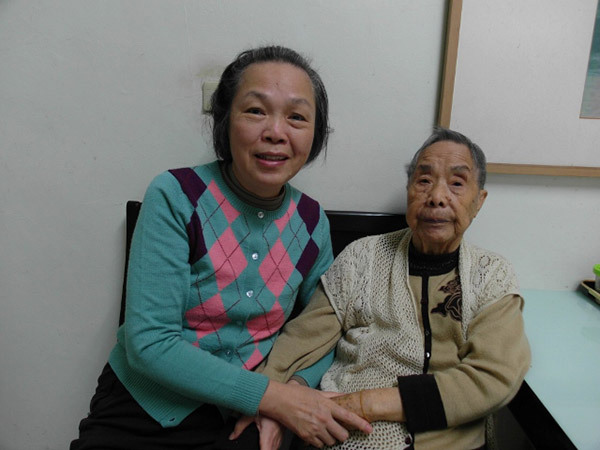 Fortunately, she grew up happily in the Tai Ji Men family, where she has many brothers and sisters who support one another. Seeing my daughter bloom like a hibiscus flower now is a great joy to me as a mother. Because of the love in our hearts, my mother, my daughter, and I are connected together. It is said that good energy brings good luck. My mother has been teaching me a great lesson. I cannot foresee my future, but I can do my best to stay healthy and happy so that I can leave a legacy of love to my daughter.